Beyond Meat: Fake chicken that tastes so real it will freak you out. Beyond Meat’s faux chicken will change how you feel about eating ersatz animal products. 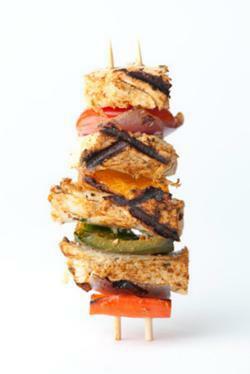 Beyond Meat’s chicken strips taste just like real chicken but aren’t widely available yet. The first time a vegetarian tastes Beyond Meat’s ersatz animal flesh, he’ll feel delighted and queasy at the same time. There’s something about the way these fake chicken strips break on your teeth, the way they initially resist and then yield to your chew, the faint fatty residue they leave on your palate and your tongue—something about the whole experience that feels a little too real. But I’ve never tasted anything as realistic as Beyond Meat. The chicken strips look, feel, and taste closer to real meat than any other food I’ve ever eaten. They’re more tender and moist than Quorn and Gardein, they’re not packed with sodium (like many of Morningstar’s products), and unlike Field Roast, they don’t taste grainy or vegetal. Beyond Meat is not perfect. Its faux chicken breaks apart in your mouth more easily than real chicken, so you won’t get strips of it stuck in your teeth. (In this way, I thought they resembled chicken breasts that have been prepared sous vide—the process of cooking food at low temperatures for a long time, yielding extremely tender results). But you only notice the slight differences if you’re looking for them. 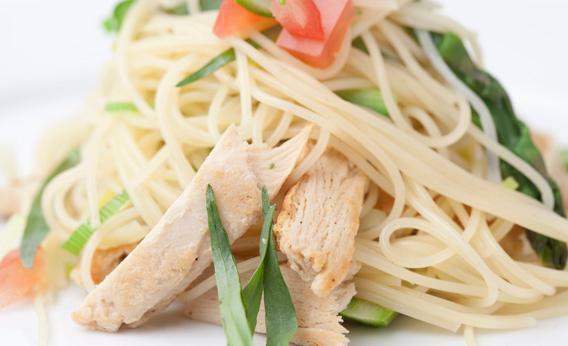 If you taste Beyond Meat’s chicken in a dish alongside regular chicken, there’s a good chance you’ll be fooled. This year, after tasting them in a sandwich wrap, New York Times food writer Mark Bittman mistook the fake stuff for the real stuff. So, too, have many others in the company’s taste tests. And once you forget you’re eating something fake, you will too. Over several days of eating Beyond Meat in sandwiches, salads, and burritos, I forgot I was eating something that didn’t come from a living creature. I was just eating something tasty. The biggest problem with Beyond Meat is that most people can’t get it yet. After years of developing its meat, the firm is just starting to ramp up production, and at the moment its chicken strips are available only at Whole Foods stores in Northern California—and they’re only in salads, sandwiches, and other prepared food. Later this year, the chicken strips will be sold in select supermarkets for people to take home and prepare for themselves. Next year, the company plans to launch the chicken nationally. Soon, it will also offer its take on ground beef. But here, too, Beyond Meat is going down a different path than its predecessors. The company is pushing for stores to stock its meat at the meat counter, alongside real chicken, instead of next to the tofu. The plan illustrates the company’s ambition, and suggests why it has attracted interest from investors who don’t normally fund food, including Stone’s Obvious Corp. and Kleiner Perkins Caufield & Byers, the famed Silicon Valley venture capital firm. I’m rooting for Beyond Meat. I talk to new tech companies every day, and I’ve rarely come across a firm that has created such a fantastic product aimed at solving such a big problem. Real meat is delicious, but it’s terrible in nearly every other way. Meat is environmentally toxic and colossally inefficient, ethically dubious (even if you’re OK with killing animals, raising and slaughtering animals in factory farms is hard to defend), and it’s unhealthy (that’s even true if you don’t eat it—there’s good evidence that the rampant use of antibiotics in livestock production has given rise to drug-resistant infections). I’d rate Beyond Meat as being 90 to 95 percent as realistic as chicken, but in every other way, it’s superior. It requires far less energy to produce, it’s got no saturated fats, no antibiotics, and no animals are harmed in the process. Brown got into fake meat after working in the clean-energy business. He says he loves the taste of meat, but his childhood on a family farm convinced him to refrain from killing animals, and he’s been vegan for many years. In 2009, he met Fu-Hung Hsieh and Harold Huff, food scientists at the University of Missouri who’d been working to create a meat substitute for more than a decade. The three formed a company, and they’ve been working to build the perfect fake meat ever since. Brown says that other hurdles remain, and Beyond Meat is constantly working to refine its methods. Making the perfect fake beef is harder than making chicken, because people expect real beef to look a bit red, from blood. Beyond Meat can add a red hue using beet juice or other natural colorants, but Brown doesn’t know yet if people will consider it strange to have bloody-looking fake meat. This sounds like a trivial factor, but one study has shown that a meat substitute’s appearance is the most important factor to consumers—even before you taste it, you decide whether fake meat is acceptable based on how it looks.